The new "Virtually Inspired" website will bring together the latest deployments of cutting-edge online learning technologies. The Virtually Inspired website highlights innovative technology deployments in online learning. Susan Aldridge, senior vice president for online learning at Drexel University and president of Drexel University Online, and Marci Powell, chair emerita of the U.S. Distance Learning Association, looked at more than 250 projects deploying new technologies in online learning and initially narrowed that number down to approximately 50 they plan to highlight on their website, which is still a work in progress. Aldridge and Powell want the site to provide one-stop shopping for faculty and administrators looking for innovative approaches to online learning. Increasingly, Aldridge said, students will not sit still for talks in large lecture halls, and still too much of online education involves a talking-head video rather than an engaging experience. As she went looking for new approaches that might be applied to Drexel's curriculum, she and Powell decided to share those findings with colleagues in higher education, who could pick and choose what might be beneficial for them. 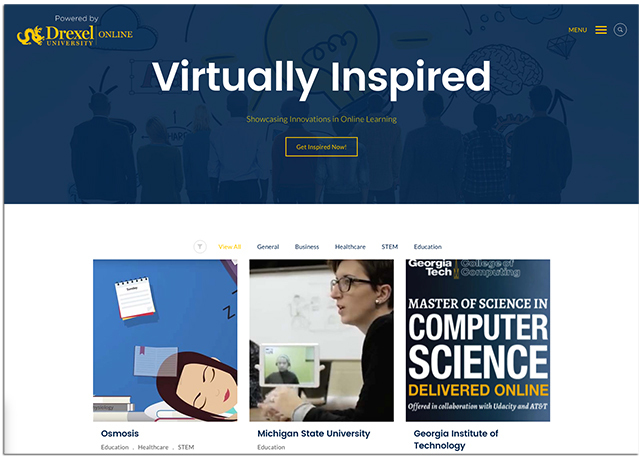 Virtually Inspired describes itself as an ongoing research project to uncover the best-of-breed technology-enhanced online courses and programs indicative of the "Online Classroom of the Future." Speaking this week in a Future Trends Forum video chat hosted by futurist Bryan Alexander, Aldridge said a year ago she and Powell began looking for new ways to showcase innovations in online learning that engage students, create new learning environments and connect classrooms to the real-world environment. "We wanted to create a website we can update regularly. Faculty are often so busy that they don't have time to do this research," said Aldridge, who previously served as president of the University of Maryland University College. By linking to the websites of these "bleeding edge" projects, she added, Virtually Inspired hopes to raise the profile of innovations in the learning environment. One of the examples Aldridge spoke about came from her own Drexel campus — the use of an avatar named Tina in the College of Nursing and Health Professions. The product of educational software developer Shadow Health, Tina is a character in a web-based interactive system like Second Life but geared toward students in clinical health professions. Nursing students can go into the virtual patient room and ask Tina questions, practicing nursing protocols in a safe environment as many times as they want and then applying what they have learned in the real world, Aldridge said. Each implementation description on the Virtually Inspired site includes videos and supplemental links to image galleries and modules, and will also include any published academic research about the efficacy of the pedagogy, Powell said. Another project Aldridge and Powell described is called Osmosis, an app created by two medical students to help other medical school students be successful. As the Virtually Inspired website notes, Osmosis was designed by two Johns Hopkins School of Medicine students from the same small cohort, Shiv Gaglani and Ryan Haynes. "Using evidence-based educational concepts such as questions, flashcards, and videos, images correlated with memory anchors, adaptive spaced repetition, collaborative learning, and gamification, Osmosis maximizes learning and retention," according to the app's website. "Osmosis grew from 240 students in 2013 when Shiv and Ryan created it at Johns Hopkins to over 5,000 within the first eight months. By word of mouth, students using the platform and calling their friends at other medical school, Osmosis currently serves over 40,000 students from hundreds of medical, nursing, and allied health professions schools worldwide." Both Powell and Aldridge spoke about the increasing use of robotic telepresence in the classroom. One example on their website involves the Michigan State University School of Education's Design Studio. As MSU researches the field of online learning, it is looking at ways to make online students feel like contributors when blended into a traditional classroom. MSU is experimenting with having online students attend by videoconferencing on a robotic telepresence unit. "The goal is to break down transactional distance by having online students be virtually present through video conferencing on robots," the website notes. As another example of breakthroughs with videoconferencing, Powell and Aldridge highlighted a project from Australia's Reef HQ Aquarium called Reef Videoconferencing, which allows students around the globe to experience high-definition sound and visuals of the Great Barrier Reef. Underwater scuba divers interact with students, giving them a first-hand experience of the marine ecosystem of the world's largest living coral reef aquarium located in Townsville, North Queensland. Aldridge noted that sometimes our research into new practices becomes too U.S.-centric — colleagues in Europe and the Middle East are working on innovations, too. "Every day there are new opportunities for sharing across the United States and around the world," she said. "It is important to take a global look."